Despite recent figures scoring 2007 as the third successive record year for new wind-energy generating capacity, wind’s contribution to the national electricity supply remains stubbornly low. Searching for answers to this paradox and ways to establish wind as a viable economic and permanent power source, researchers, environmentalists and big business share an unexpectedly similar vision. They say for wind to justify some of the lofty claims being made in its name requires ongoing financial incentives, a proactive approach toward building new transmission infrastructure and aggressive federal steps to address climate change. The American Wind Energy Association, in its just-released 2007 market report, said a record 5,244 megawatts of wind capacity — enough to power around 1.5 million homes — was added last year. Total capacity grew by 45 percent and represented an investment of more than $9 billion, said the Washington, D.C.-based agency. Capacity from installations across 34 states is now sufficient to power more than 4.5 million homes. Ryan Wiser, a scientist at the Department of Energy’s Lawrence Berkeley National Laboratory near San Francisco, said such sustained growth puts the U.S. ahead of the global field in building new wind power plants. But despite repeated record gains and wind’s almost imperceptible environmental footprint compared to nuclear or fossil fuels, the U.S. continues to trail in the proportion of wind-generated electricity it uses. 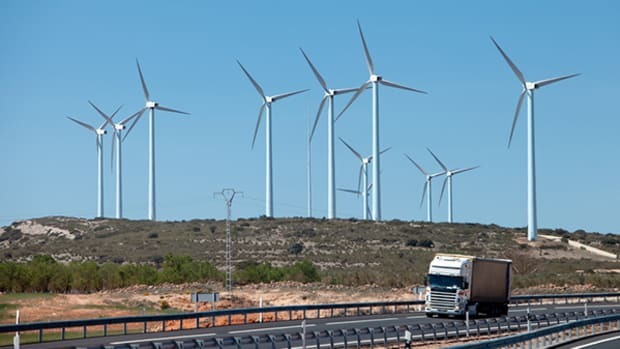 Only a fraction more than 1 percent of its electricity comes from wind, compared to about 21 percent in Denmark, 10 percent in Spain and around 7 percent in Germany and Portugal; even the U.K. is almost twice as reliant on wind power as this country. It wasn’t always so. The U.S. wind power market, led by California, exploded in the first half of the 1980s, spurred by soaring oil prices, blossoming environmental awareness and memories of the 1979 nuclear accident at Three Mile Island. But Wiser said the economic motivation dissolved as oil prices retreated. As a result, wind energy stagnated here just as it took off in Europe, propelled in part by a deeper environmental ethic. “Now we’re five to 10 years behind Europe,” he said. Surging investment in recent years owes much to a federal incentive program, the renewable electricity production tax credit (PTC), which has proved to be a boon for wind, biomass and geothermal energy. “The federal tax credit is of paramount importance to the success of wind energy,” said Jeff Deyette, an energy analyst and researcher with the Union of Concerned Scientists in Cambridge, Mass. Announcing the 2007 results, AWEA executive director Randall Swisher sounded a note of caution. “The PTC and tax incentives for other renewable energy sources are now in danger of lapsing at the end of this year — and at the worst moment for the U.S. economy,” he said. The PTC is worth about 2 cents for every kilowatt-hour produced; a kilowatt-hour, for example, would be the energy needed to burn 10 100-watt bulbs for an hour. Credits last 10 years from the date they start, and Wiser estimates annual costs are running around $1 billion for all current projects. Wind advocates agree the tax credit enjoys strong bipartisan political support, and few expect the presidential election result to change that. Rather, as the industry continues to expand, debate focuses on the cost and where to find that money. According to Deyette, all energy technologies receive government subsidies, with nuclear power’s share greater than all the renewables’ shares combined. However, he said, support for coal, oil and gas is a lot less transparent than support for wind, so the true costs remain harder to measure. On three occasions, the PTC has been allowed to expire before being extended again, a stop-and-go pattern that has buffeted the wind industry, scrambling long-term strategic plans and ushering in a period of uncertainty for investors. When the tap is turned off, as it was temporarily in 1999, 2001 and 2003, it very quickly creates “a whole chain of negative economic consequences,” said Christine Real de Azua, assistant director of communications for AWEA. Federal and state incentives were a factor in the decision to build Horse Hollow Wind Energy Center in Texas, the world’s largest-capacity wind farm with a single owner (FPL Energy), said company spokesman Steve Stengel. The $1 billion project helped push Texas to the top of the 2006 list of wind energy states, tipping longtime leader California back into second place. Last year Texas consolidated its lead, following what Stengel considers an enlightened game plan. Despite impressive development of bigger and more efficient turbines, it’s likely to be many years before wind starts shouldering a significant part of America’s energy burden. More needs to happen, Wiser said, for wind power to reach the levels suggested by AWEA (20 percent) or the Brussels-based Global Wind Energy Council, which sees wind providing 16.5 percent of world electricity by 2020 and 34 percent by 2050. He believes the U.S. will need to quadruple annual generating capacity to get into the double digits, and even then it could be 2025 to 2030 before we hit 20 percent. Stengel shares a similar view: “Forecasts of 20 percent by 2020 are simply not achievable,” he said. Transmission is one of the keys. The typical isolation of wind farms, while it may dampen concerns about visual pollution, noise and lowering property values, has created intractable distribution problems. Wiser said it’s not clear how the considerable costs will be shared between producers, end users and others, while transmission also presents special land-use and permitting challenges to state and regulatory agencies. Deyette hinted at one solution: Current research on capturing more energy from lower wind speeds could open up land closer to population centers, reducing the need for extra transmission lines. Researchers are also looking increasingly at offshore wind farms, the direction being taken, partly out of necessity, in Europe where population density means less land is available for wind farms. Deyette said farms far out to sea can employ much larger turbines and take advantage of greater and more consistent wind speeds; they may also mitigate visual and aesthetic problems, although underwater transmission creates additional headaches.